The month of July is a time of transition in the perennial garden. Many of the early blooming perennials are starting to wind down, allowing others to take center stage. Aside from an early infestation of aphids on my Lupines, I am having a good year in the flower garden. 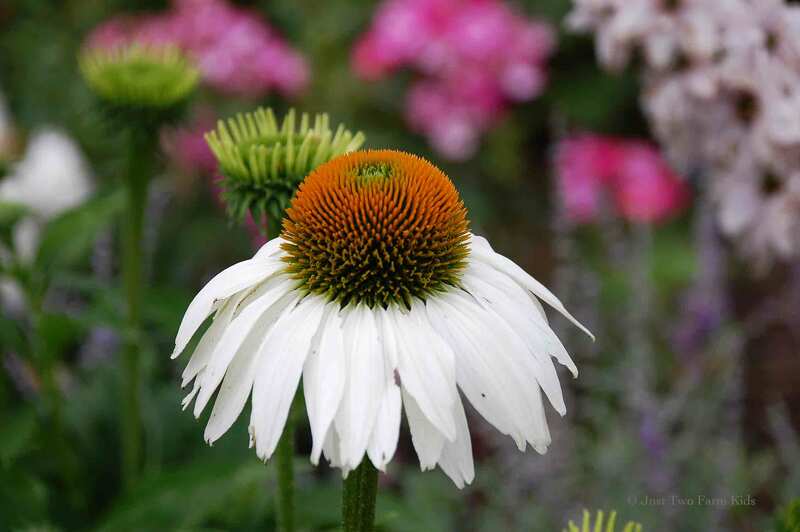 I planted some White Coneflowers last fall and I am enjoying their first season of blooms. I rescued these pretty pink Delphiniums last July from a plant sale at one of those temporary nurseries set up in the grocery store parking lot. The leaves were severely damaged from inconsistent watering and dwindling attention as the peak planting season passed. The 75% off sale price convinced me to take a chance on the sad plant and much to my surprise, it came through the winter strong. The Russian Sage was a new addition this spring.